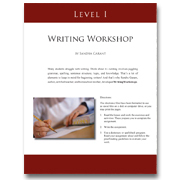 Writing Workshops, Levels I-IV by Sandra Garant, a veteran homeschooling mom and a certified teacher, help young writers develop their descriptive, creative, and expository writing skills. Each writing workshop is ideal for a semester’s supplemental course in writing composition. In Writing Workshop, Level I (ages 9-11), students write riddles, create sound effects, write descriptions with all five senses, use repetition, and more! Children will enjoy the reading resources and games that provide a warm-up to the writing assignment. Self-evaluation questions guide parents and children toward the essential elements of each assignment. Usage permissions: unlimited family use. Ideal for one semester. Six lessons, 39 pgs. Includes review assignments. 4 MB. Recommended core E-book in CHC Lesson Plans for Fifth Grade. Tour this title within the Fifth Grade Interactive Guide! Sandra Garant is a veteran home schooling mom, business writer, certified teacher, and attorney. She taught her three children at home until they were ready for college. She has written several books, including Creative Communications: Thirty Writing, Speaking, and Drawing Projects for Homeschoolers. She is married to George Garant, and they live happily in San Antonio, TX. Sandra attends Our Lady of the Atonement Church. She is a member of the San Antonio Chesterton Society and the Catholic Lawyers Guild of San Antonio.